Now this year someone else joined the family – and let me tell you, the thoughts and anxiety of: “WHAT WILL LUCY BE FOR HER FIRST HALLOWEEN??? !” hit me as far back as mid-June. It turned out her costume came naturally to her…from her name, to her red hair, baby Lucy was the inspiration behind our family costume! This year I am proud to say that I will carry out my dad’s halloween spirit in my own family – check out the adorable mini Lucy and Rooney Ricardo! Rooney’s adorable suit and tie was from Petoga Couture and his Ricky Ricardo style hat was found on amazon. I made his little bongo drum out of a cardboard flower pot and a canvas bag. Lucy’s sweet “I Love Lucy” dress and my matching apron (below) was purchased from LoverDoversClothing. Now on to some more fun! Since Bryan and I’s halloween celebrations consist of changing diapers, putting a baby to bed by 7:30, and diving into the bags of halloween candy that are supposed to be for trick-or-treaters, I was able to really admire what creative friends/family I have! I want to highlight my favorite halloween costumes that I saw over the weekend and today from some of my favorite people! Enjoy! SO lets just start out strong. This is by far my FAV group costume ever. My friend Ashley (the blue yip-yip in case you couldnt tell ha!) goes all out with her costume on halloween, so much in fact that I look forward to her costume every single year. This year was definitely not a let down, I present the Martians…BONUS: watch them in action in the video below! Our friends Danielle & Dillon are the first of the awesome couple costumes I want to highlight. The cardboard head, locket, pigtails, and that unibrow of perfection makes this such an amazing costume! Next on the awesome duo costume, my friend Jess and her friend Chantal knock their Marv and Harry from home alone costume out of the park! The details are spot on, from the feathers to the awesome iron imprint on Harry’s face! Another couple whose costume I always look forward to our are friends Tim & Chelsea. This year’s Wayne’s World get-up was totallyyy tubular! Party on, Garth! Party on, Wayne! Little Jasmine is making the cutie-pie meter go off through the roof in her sweet bumble bee costume. Jasmine is celebrating her very FIRST halloween and couldn’t be more beeeee-autiful in her costume! Hello there adorable neices and nephew of mine! These three cutie’s always go all out with their costumes! From the adorable lantern and tri-cornered hat, the satin gloves and sparkly dress, and the amazing League of their Own uniform, these kids (and their super crafty/creative mom) always have the perfect accessories and costumes! Remember how I said my sister, brother, and I always went all out on Halloween when our dad took us out trick-or-treating? Well, my sister has been carrying on the tradition with her family for years now and this year her whole family looked as if they came straight out of a fairytale with their adorable Little Red Riding Hood costumes. Is that not the most fierce Big Bad Wolf you have ever seen and the sweetest Little Red Riding Hood? Melting. Can you spot the real baby? Another first halloween for this sweet little rag-doll, Cora. Cora’s mommy and daddy are OBSESSED with halloween and always do-it-up with their own costumes and house decorations. Baby Cora is in for a lifetime full of great costumes, that is for sure! And with that, I bid you all a Happy Halloween! Tonight we plan on passing out candy to the neighborhood kids and/or eating all of the rest of the candy we bought for them. Hope you all have a spooktacular and safe halloween night! To celebrate my blogs new appearance I wanted to look back at all of my different title taglines that the old original template lived through. These taglines changed throughout the past 3 years as our life has evolved and I love the story it tells. After three years of blogging, I decided it was time for a blog facelift! The blog started with a post titled “Home is where one starts from” – a line from T.S. Eliot’s Four Quartets. This was a fitting beginning to our story having just become husband and wife and going through the process of buying our first home. I can remember that time like it was yesterday, eagerly anticipating our life ahead with such excitement and wonder. The reason I can remember the feeling so well is because today I am still filled with the same excitement for what is to come. 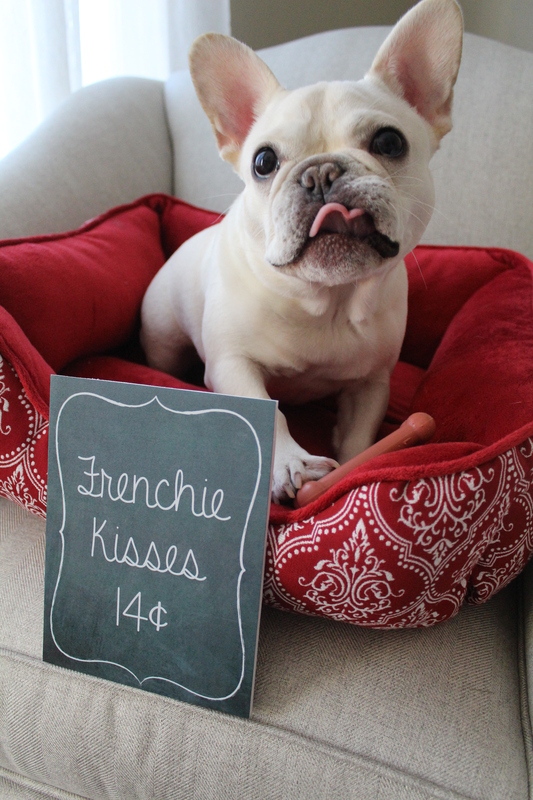 Our next chapter was bringing home our French Bulldog, Rooney, and realizing that our hearts grew in size as our new love for this silly boy filled them. “Puppy makes three” was a fitting tagline for our new chapter as our life as doggy parents began. I couldn’t imagine how dull our life could have been without our sweet bundle of Rooney in it. He makes us smile every single day and that totally makes up for all of the mischief he gets into! That leads to the present tagline and the title of this post – “little feet, little hands, little baby”. This is a line from Dave Matthews Band’s song, So Much To Say. Bryan and I both have a strong love for Dave Matthews Band and the line just seemed to fit this next chapter perfectly when we welcomed our daughter, Lucy. Lucy’s entrance into our family has truly been the most amazing chapter of all. I cannot put into words the amount of love we have for her. To honor this current tagline, please find my photos below which reflect the line by showing Lucy’s “little feet, little hands”, our perfect “little baby”. One unsuspecting day in October, we invited our parents, Bryan’s grandma, and my brother to come to a “Fall Party” at our home. It just so happened to coincide directly with when we would be finding out the gender of our little one! I couldn’t let the surprise factor go to waste so this post will highlight our “Fall Party” turned SURPRISE “Gender Reveal Party”. One unsuspecting day in October, we invited our parents, Bryan’s grandma, and my brother to come to a “Fall Party” at our home. We had been wanting to have all of our parents over for quite some time to show them our gratitude and thanks for everything they do for us. It just so happened to coincide directly with when we would be finding out the gender of our little one! I couldn’t let the surprise factor go to waste so this post will highlight our “Fall Party” turned SURPRISE “Gender Reveal Party”. To start, Bryan and I prepared a ton of home-cooked food for our family. I was able to bust out my fall decor and pretty dishes and light all my fall scented candles. Bryan was the master chef of the day, and prepared pretty much all of the food. We had an assortment of amazing appetizers which included antipasto kabobs, shrimp, buffalo chicken dip, veggies, and deviled pumpkin eggs. For the main course Bryan made an amazing apple cider pulled pork with apple coleslaw, homemade crab mac & cheese, and salad. Bryan’s famous deviled eggs, Halloween style! Between appetizers and the main course, we decided to use that time to surprise our parents. We had originally told them all that we were unable to get an appointment to find out the gender until the following week. This little white lie seemed to work. 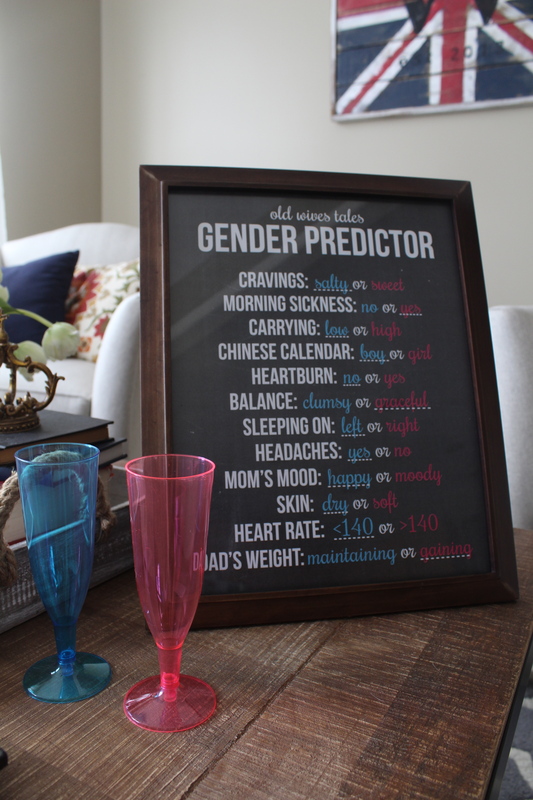 I then set up a “Guess the Gender” station where I instructed everyone to pour champagne into a pink or blue flute and whichever color they chose would represent their guess as to what baby’s gender would be. To aid in their decision, I also made an “Old Wives Tale: Gender Predictor” chart that showed some of the symptoms I was experiencing where the underlined word represented what the old wives tale said about the symptom. Once everyone casted their votes (about 20 minutes later…it was a tough choice!) we took group photos so that we would have “evidence” of who was right and wrong. Bryan and I casted our votes too. On the morning before the appointment we made sure to each cast our OFFICIAL guess so that we would be able to participate in the fun. Wouldn’t ya know it, Rooney even decided to place a guess! After all of the guesses were made, we had another part of the plan in order to surprise the family. 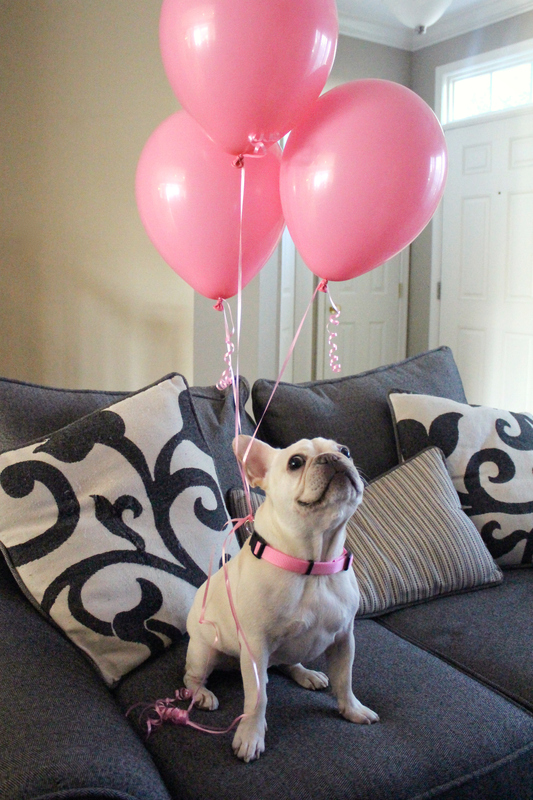 Bryan took Rooney downstairs to the basement to go outside to take care of his business…and when Rooney came upstairs he delivered the news with a balloon that was tied to his collar! Here is a video of exactly what happened! A few days later we announced the gender on social media to the rest of our family and friends. Since Rooney had already done so well announcing at the party, we let him do the honors on Facebook too! The Easter Bunny decided to visit Bryan. Bryan has always been very into golf, but this year especially he has been obsessive about it! The creative wheels in my head started turning and here is what it came up with. I finally smelled the first spring scented day last week. It was that unmistakable freshness after a warm rain and the buds of new life sprouting. Perfect timing too, Spring, because this weekend was Easter and we were able to spend it outside with family soaking in some much needed vitamin D. Bryan and I had a wonderful Easter meal at my mom’s house and it was followed by quality time outside talking, laughing, watching the four dogs run around (and Rooney run into the screen door), and watching my step-sister and her fiancé fly kites. Afterwards we went to my dad’s and enjoyed some more time outside while catching up and planning for our 4th of July trip to the lake house. Can we fast forward to July please? Now for my fun little Easter project this year. The Easter Bunny decided to visit Bryan. Bryan has always been very into golf, but this year especially he has been obsessive about it! We’ve had only a few warm days so far this year (I could count them on one hand), and he has already been out golfing twice and to the driving range at least once a week since March. The creative wheels in my head started turning and here is what it came up with. 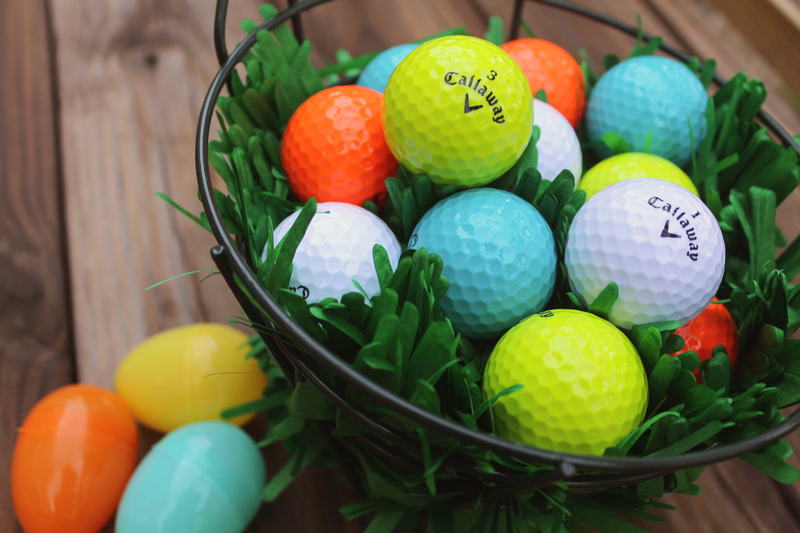 The bunny has laid golf ball eggs in a variety of Easter colors! 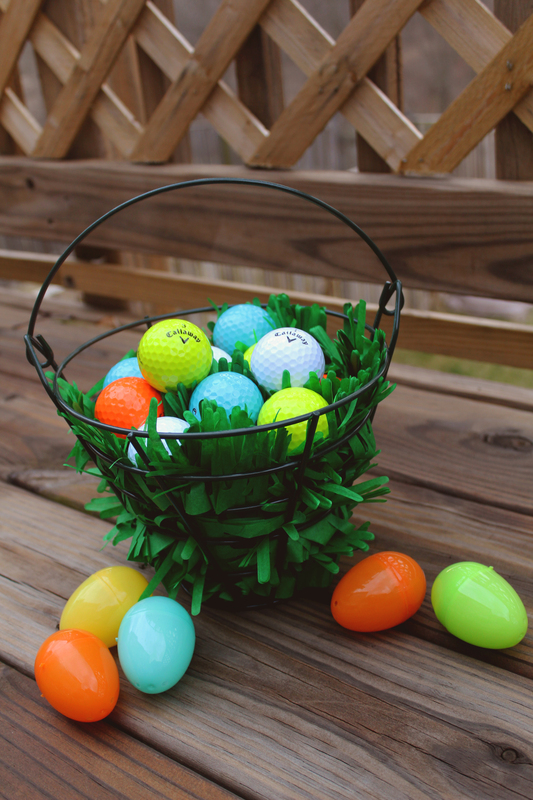 I used a driving range bucket to replace the traditional Easter basket. Bryan loved the basket and is excited to start using the new golf balls. He then used this opportunity to let me know of HIS surprise. He bought me my own set of clubs for our upcoming anniversary! 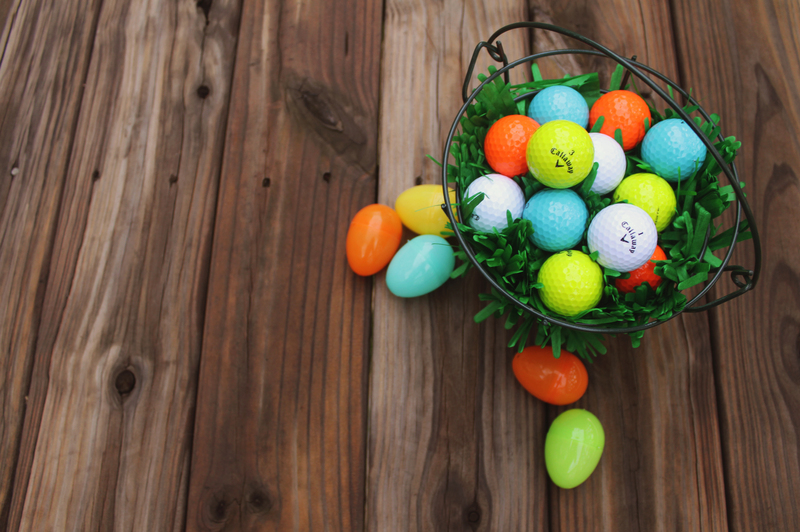 I am so excited to be able to start playing – and on top of that, what a perfect week for all of this golf gifting as it is the week of the Masters! 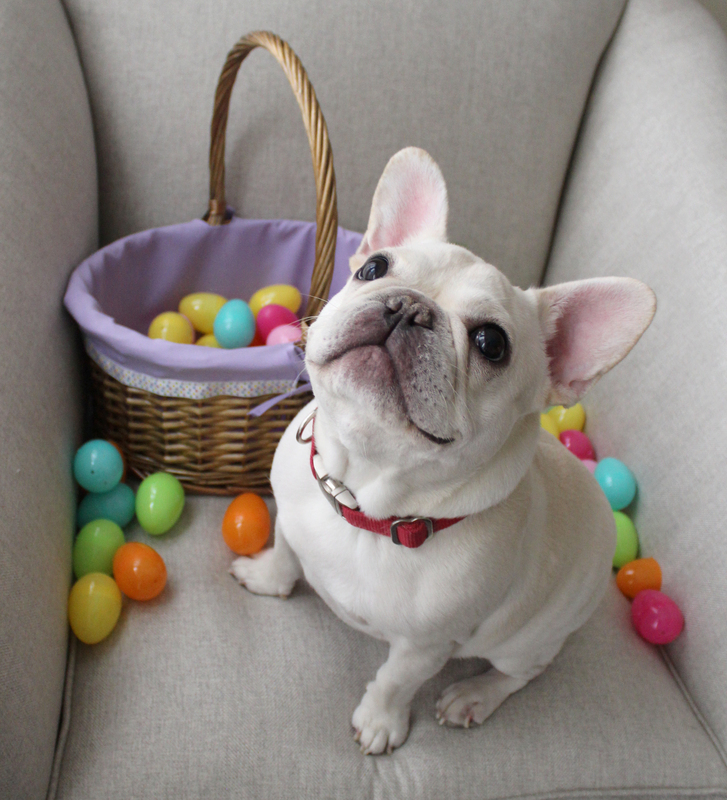 You really thought you would get to the end of this post without a Easter themed Rooney picture? 14 cents is QUITE a steal! Valentine’s Day 2011 proved to be the best Valentine’s Day I had ever had. Bryan surprised me the weekend before and pulled out an envelope that had a photo of the Boston skyline inside. He then let me know that on Valentine’s Day morning we would be flying into Boston for the night and coming home the following day. Keep in mind this was before we were even officially dating. So February 14, 2011, we flew to Boston and had the most amazing trip. He took me to Fenway Park (Go Red Sox! ), we had dinner at amazing Italian restaurant, and we walked around one of the most charming cities i’d ever seen. The next day I had planned a little surprise for him. Long before we started dating Bryan told me, “just let me know when you are ready to start dating”. On the way home from our trip I pulled out a Mix CD that I made and played it. Each and every song on the CD said “I’m ready” or referenced being ready. He then asked me to be his girlfriend which lead to us becoming official. The Valentine’s Day trip that started it all. And now to Valentine’s Day 2015: I’m just going to come right out and say it. Bryan and I used to have an addiction. Okay, okay, so maybe it was that we were just obsessed with peanut butter and fluff sandwiches when we first started dating. This year, in celebration of our love for this combination, I came up with the a cupcake that would pay tribute. Bryan’s favorite dessert is red velvet cakes/cupcakes so I wanted to use that as the base to my cupcake. I wanted to surprise Bryan with what I call Red Velvet Peanut Butter and Fluff Cupcakes. I used two different recipes and then my own ideas to create the final cupcake. 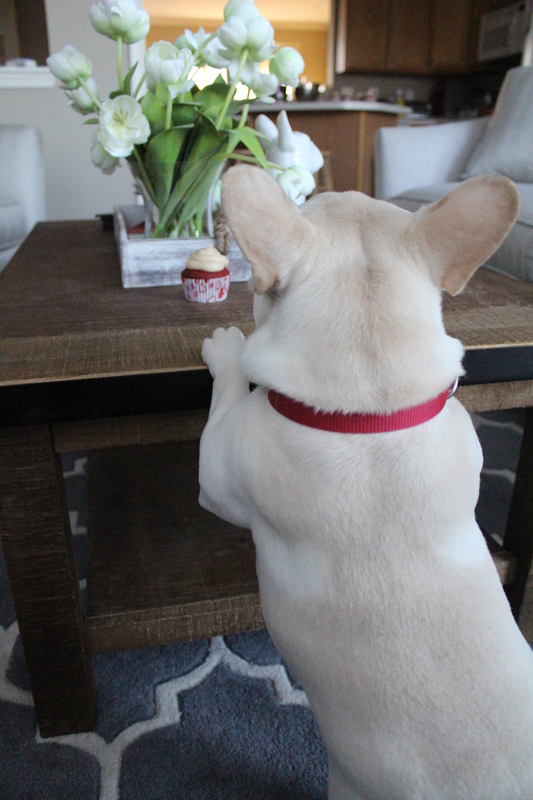 Let’s just say that my Valentine loved them – here we are two days later, and there are no more cupcakes. For the red velvet cake part of the cupcake, I did my research and ended up using Sally’s Baking Addiction‘s Red Velvet Cupcake recipe. I found this recipe to be easy to follow and made 14 delicious cupcakes. Preparing the dry ingredients first. Using the Kitchenaid to combine the wet and dry ingredients. After adding the red food coloring, I filled the cupcake liners. Fresh out of the oven after baking at 350 degrees for 20 minutes. While the cupcakes baked and cooled, my next focus was on the peanut butter icing. The Peanut Butter Cream Cheese Icing recipe I followed was found on food.com. This icing is to DIE for if you like peanut butter. The delicious smooth Peanut Butter Cream Cheese icing. After letting the cupcakes cool, it was time for me to add my personal touch to the cupcakes. The icing incorporated the peanut butter side of peanut butter and fluff sandwiches, so I needed to now add the fluff. I used a cupcake corer to take out the center of each cupcake and then I filled each cupcake with a generous amount of ooey gooey marshmallow fluff. After filling each cupcake I finished the cupcake by piping on the peanut butter cream cheese icing. Using a cupcake corer to remove the centers of the cupcakes. Piping the fluff into each cupcake. Completing the cupcakes by adding Peanut Butter Cream Cheese icing. Voila! Red Velvet Peanut Butter and Fluff cupcake. And there you have it! Just looking at these photos makes me wish I could go take a bite out of these right now. The cupcakes were just the start of our Valentine’s Day surprises. Bryan surprised me with a 70 minute couples massage which was just AMAZING. We both came out feeling completely relaxed. We then enjoyed a nice dinner at home because the snow kept us from going back out to our dinner reservations, and I was completely fine with that. Rooney you are my Valentine too, but these aren’t for you! 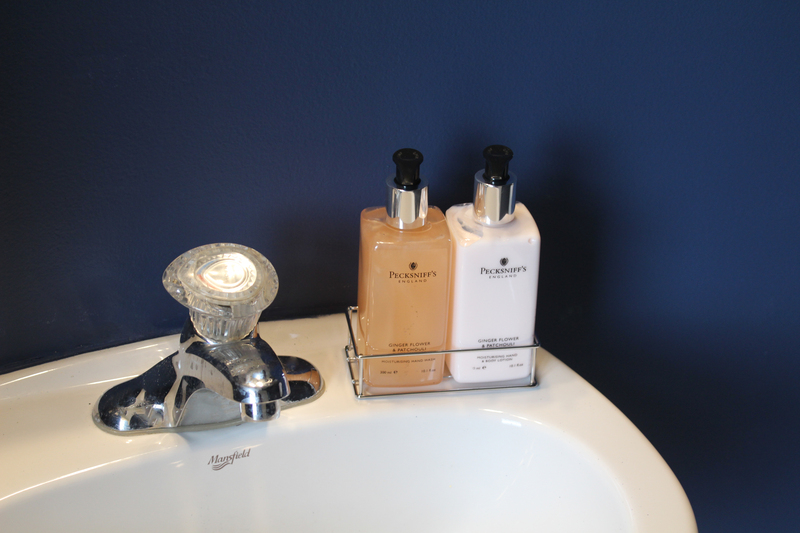 After fully making over the morning room, our powder room which on the same level needed a little freshening up! 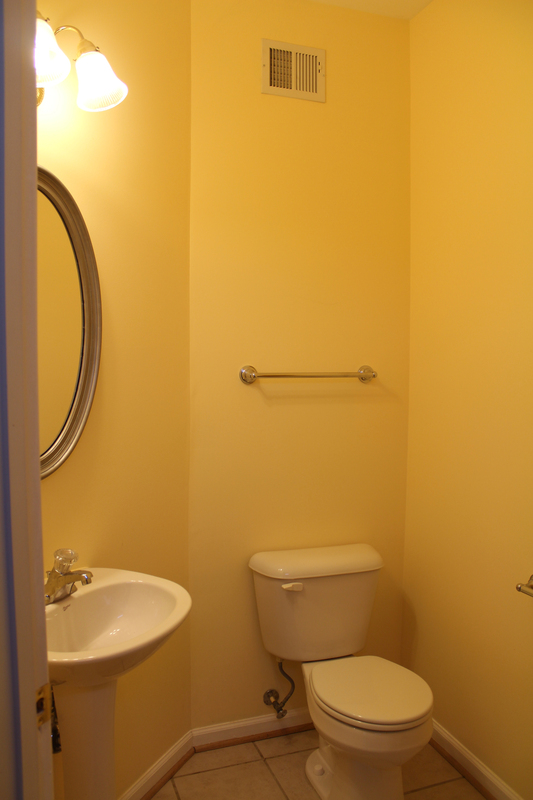 Something about a bright yellow bathroom just doesn’t do it for me! 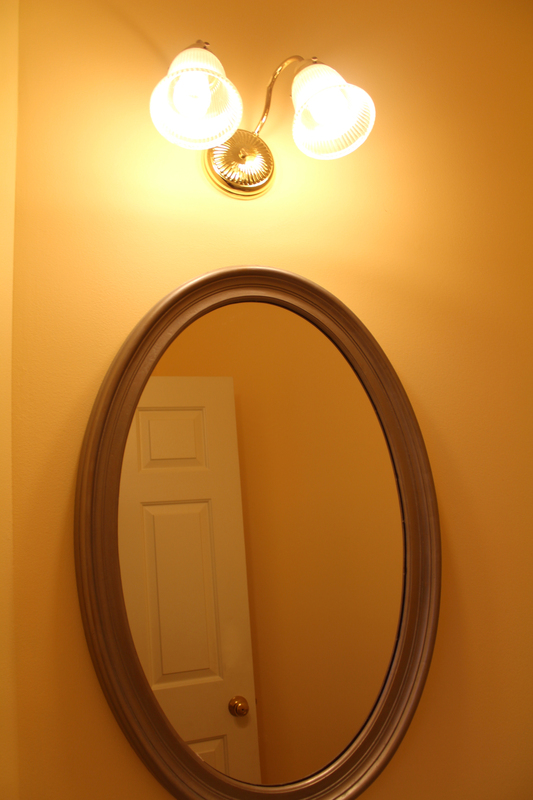 This gold light fixture had to go. I went to the hardware store paint counter and I brought home many shades of blues and grays and taped them all over the wall. 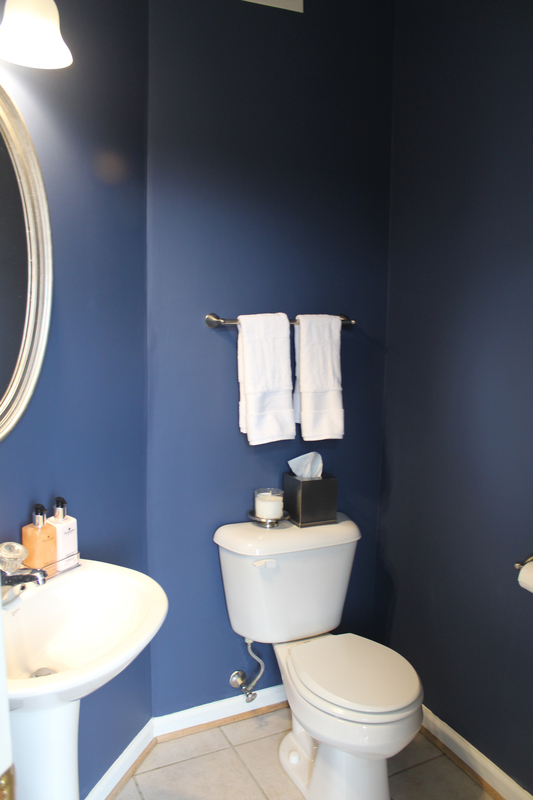 Bryan walked in and must have thought our bathroom had morphed into the paint color swatch wall at Home Depot. After many trips to and from the store, we finally decided on the perfect color blue. 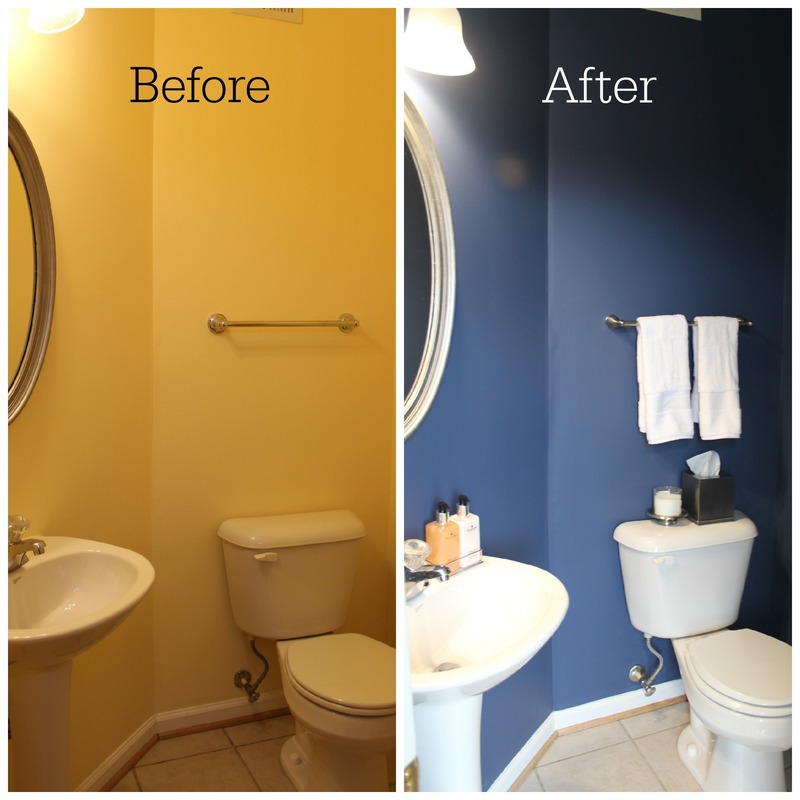 The color that we went with in the end is called English Channel by BEHR. We were able to prep the space and get the painting finished last Saturday and on Sunday, my dad came over to help us install a new light fixture, toilet paper rack, and hand towel rack. 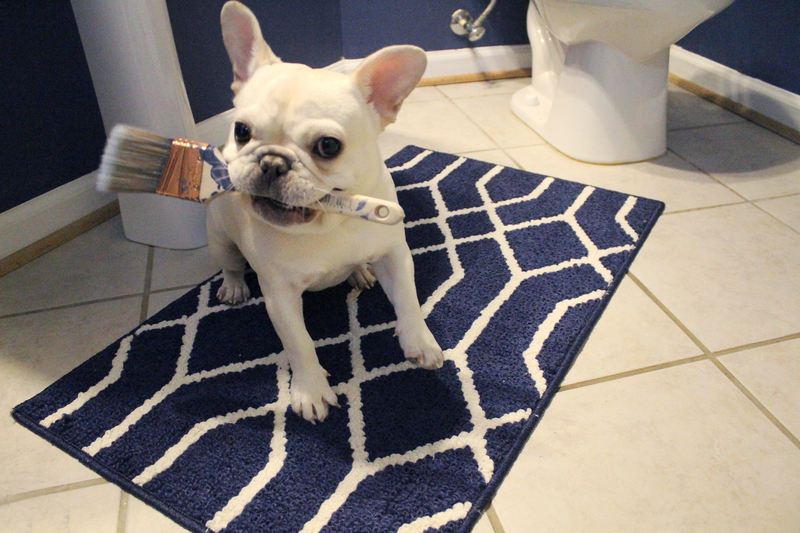 Afterwards, I accessorized the space a bit with new hand towels, bathroom accessories, and a rug to save our feet on that cold winter tile. I also found hand soap/lotion, Pecksniff’s in Ginger Flower & Patchouli, which I highly recommend. 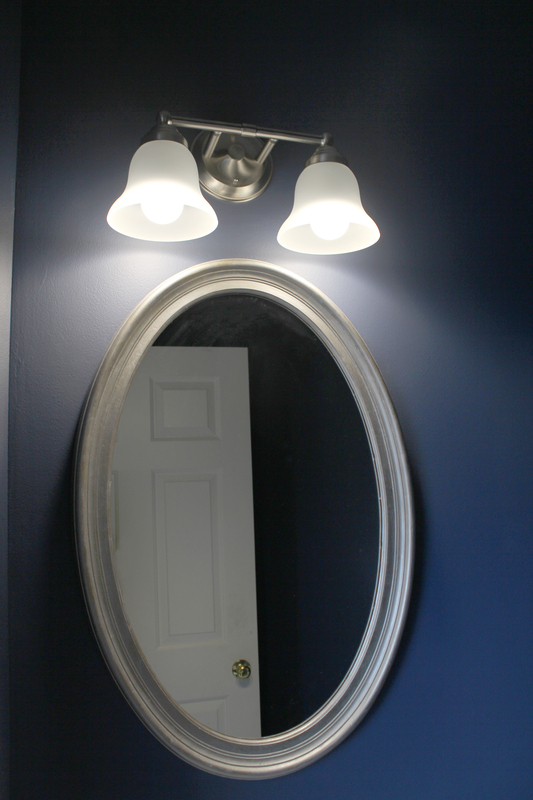 Powder Room refresh = success! English Channel by BEHR. This Ginger Flower & Patchouli scent is absolutely amazing. Side-by-side comparison. Goodbye yellow, hello navy! I am still trying to determine if a piece of art on the wall or some shelving adjacent to the toilet might someday be incorporated, but for now we are happy with our little weekend project, we even had a certain puppy help us with our painting!